Whole Foods shoppers can expect to see animal rights activists in stores across the country accusing the grocery chain of perpetuating animal cruelty and consumer fraud in the coming week, with protests expected to stretch far beyond Thanksgiving. This was the announcement made by Direct Action Everywhere, or DxE, in front of Whole Foods’ 2001 Market St. location on November 23. 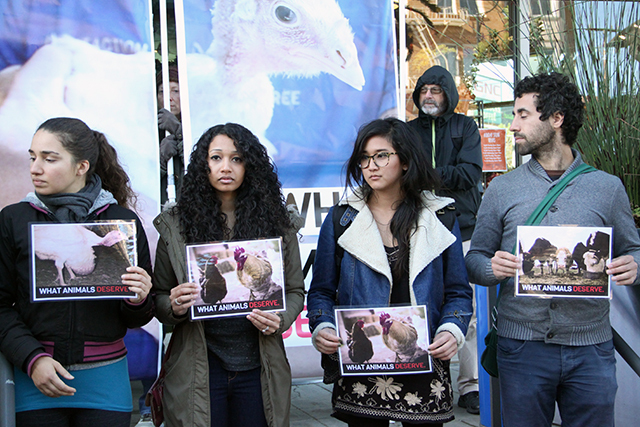 The international, grassroots animal rights action network held a press conference on the steps of the popular eco-minded grocery store, which in recent advertisement campaigns has taken pride in ensuring that the meat it sells comes from animals that are treated humanely. “The standards that they claim to meet are not being met,” said Sapphire Fein, one of DxE’s lead investigators. The group alleges that a nine-month investigation by their activists revealed “horrendous conditions” at a Whole Foods turkey farm supplier, and they are now accusing the farm of violating animal cruelty law and the corporate chain of consumer fraud. “We wanted to see what the best, most ‘humane farm’ in the Whole Foods supply chain looked like– but what we found was a nightmare,” said Wayne Hsiung, former professor of law at North Western University, who led the team of investigators. The group promised a month of actions and “dramatic” protests nationwide against what they say is consumer fraud and systemic violence in the animal agriculture system, perpetuated by corporations such as Whole Foods. At the press conference, organizers said Whole Foods deceives shoppers by painting a false picture of the conditions at the Diestel farm, which they described as the poster child of the chain’s marketing campaign. The turkeys sold on the grocer’s shelves, activists alleged, are not exclusively raised at Diestel’s Sonora, Calif. farm, which is used for advertising purposes and has received a Step 5+ rating in Whole Food’s Animal Welfare System, a multi-tiered animal welfare rating program. Instead, DxE alleges that the meat comes from other Diestel locations that are not used in advertising, including a facility in Jamestown, Calif., which is rated at Step 3. The cost difference between a Step 5 and a Step 3 rating is roughly $2 per pound of turkey meat. In a written response on the Diestel Ranch, Whole Foods stated that it sent “an expert team to evaluate the conditions of the Diestel farm” within hours of viewing the video footage. The team’s evaluation claims that conditions were not as they were portrayed, and the grocer questioned DxE’s motives. In its advertising, Whole Foods markets the Diestel facility as being humane, environmentally friendly, and free of chemicals, and the birds shown in its promotional video are plump and roaming the farm freely. But Hsiung said that his group’s investigation found the reality of the approximately 2 million turkeys living and dying on Diestel farms each year to be quite different. Hsiung said he and his team spent some 40 hours investigating behind Diestel’s closed doors. “There were boxes and boxes of chemicals in the barn, some of which were used in the feed of the birds,” he said. Undercover video footage shot by investigators shows hundreds of birds in crowded sheds, some with gaping injuries and infections, others laying dead on the floor. According to the group’s findings, the death rate of the birds at the farm was pegged at 7 percent per week, and this percentage does not apply to the turkeys that were slaughtered for sale. “There can be no question that, among all major companies in the supermarket sector, Whole Foods Market has been the leader on animal welfare,” said Wayne Pacelle, President of the Humane Society of the United States, in a written statement on September 18. Pacelle said that the retailer took animal welfare “to a higher standard” by implementing the “5 Step” welfare rating program, which is administered by an organization called the Global Animal Partnership. “It has no real audit system, no real enforcement and no real integrity,” she said. DxE maintains that system’s third party auditors are handpicked by Whole Foods, and that a former executive director served as a Whole Foods’ Global Meat Coordinator prior to being hired by Global Animal Partnership. Indeed, Slate reports that a significant portion of Global Animal Partnership’s funding came from Whole Foods, according to tax documents. DxE’s investigation comes in the wake of other accusations against Whole Foods this year. Another video released early this year by the groups shows the mistreatment of hens at Petaluma Farms, which supplies eggs to Whole Foods. In September, PETA filed a lawsuit against the grocer, alleging that the “Step” system is flawed. So The Humane Society is in bed with Whole Foods’ marketing scam? How much money does Whole Foods pay HSUS to sing its praises? Is it true that Whole Foods’ CEO is on the Board of The HSUS? Because if that’s the case then it would seem that the fraud extends beyond just the GAP program and Whole Foods. This article is missing one of the main points that we are trying to make with our investigation and report: There is NO SUCH THING as humane animal agriculture. You can’t humanely kill animals who don’t want to die. As Wayne has put it elsewhere, “There’s not just factual but moral fraud here. We would never say that killing our dogs is ok, so long as they are raised in humane fashion. What’s different about a turkey?” Animals should not be treated as our property, as “things” for us to use.